If you've found dog fleas or ticks living in your Cocker Spaniel's coat or in your home, don't panic. Learn more about fleas and ticks and how to banish them for good with our FREE online guide to tick and flea control...read on for more. Ctenocephalides canis, more commonly known to you and me as the humble dog flea, can certainly make your Cocker's life a misery, not to mention yours! Unfortunately, it's almost inevitable that at some point in your Spaniel's life he'll play host to these annoying little parasites. 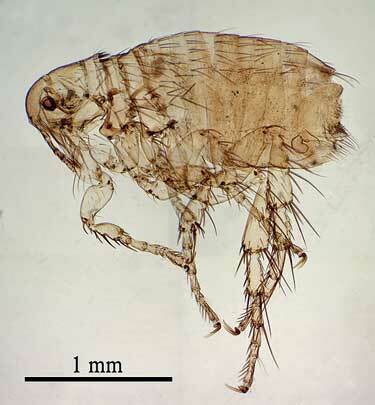 Dog fleas are so small that you can't really see any detail. This is why most dog owners know a flea when they see one, but don't actually know what they really look like. Follow the link for a really close look at one, they're not a pretty sight, so you've been warned! Fleas can cause intense itching and scratching, (which can result in hair loss and infection) tapeworms, anemia and flea allergy dermatitis. If your pet is infested with fleas (even if he's only picked up a couple), it won't take long before it becomes an infestation. Once that happens, you'll need to get to work straight away to eliminate them. Understanding their life cycle and their habitat will help you to banish your dog's unwanted hitch-hikers for good. 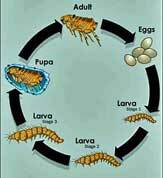 If you're going to be successful in getting rid of fleas, it's helpful to understand their life cycle. There are four stages: adult, eggs, larvae, and pupae. Simply killing the fleas isn't enough. The reason for this is that even if you kill the adult fleas, given the right conditions, any eggs already laid will hatch, and any larvae and pupae will continue to grow and will eventually become adult dog fleas. These fleas will then feed, mate and the female will lay her eggs...and the infestation will begin all over again. Learn more about the flea's life cycle, their habitat and what you need to do to be certain that they're eliminated at all stages. Flea bites are actually puncture wounds that the flea inflicts when feeding on your Cocker's blood (or yours for that matter!). 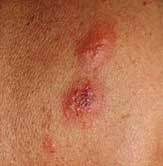 They appear as red blotches and may become inflamed and/or swollen and can be annoyingly itchy! This allergic reaction is caused by an enzyme in the flea's saliva which causes irritation and an uncontrollable desire to scratch. If the bites become infected they will probably need treatment. Flea bites on humans or our pets are no joke as they can, and often do, make our lives miserable! Flea control needs a systematic approach - first treat your Cocker to break the cycle and then treat your home. Getting rid of dog fleas on your pet can be tackled quite easily using either a parasite control treatment from your vet, or a natural flea control. A natural remedy can be just as effective. You'll find plenty of safe home remedies to choose from, but I recommend you check with your vet that the one you choose is okay for your Cocker Spaniel. And remember, flea medication should be applied properly for it to be fully effective for your pet. And remeber, if you find fleas on your dog you can almost guarantee you'll find fleas in your home too! Getting rid of fleas in the house will require a thorough strategy as there's a strong possibility that there will be immature fleas, eggs, larvae and pupae deep in the pile of your carpets, as well as on soft furnishings, under the edges of your furniture, and in cracks and crevices. Getting rid of fleas in your carpets will need your special attention, and may take a little longer, if you are to catch and eliminate all forms of this parasite currently lodged in the fibers of your favorite rugs. It's important to continue treating your pet and your home until you're certain that they're both clear. If you walk your Cocker Spaniel through grassy fields and woods you may find he picks up a couple of hitch hikers in the form of ticks so you’ll need to learn how to manage these little blighters too. Dog ticks are small crab-like critters that can grow to the size of a small finger nail after they've fed on your dog's blood! Apart from being unpleasant, they can harbour Lyme disease too so it's important to check your pet for ticks after every walk! Stay vigilant; check your pet for ticks and fleas often to keep your dog healthy! Follow the link to learn more about dog ticks: what diseases they can pass on, how best to find them on your Cocker; how to remove them safely and quickly; and how to protect your Cocker Spaniel from them in the first place. Remember to check your Cocker's coat regularly for ticks and fleas, as well as searching for signs of them, such as dried blood or eggs. Also keep an eye on your dog for tell-tale scratching. Grooming your pet regularly gives you an opportunity to check for parasites and will allow you to spot and treat an infestation before it really becomes a problem. I also take a quick look through Max's coat each evening when he's lying quietly, and have a good old root around. It only takes a couple of minutes and if there's something there I can act quickly.